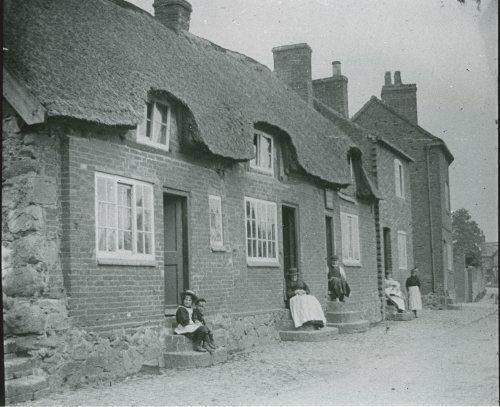 "Passing along we come to three old thatched cottages standing high above the road, built so no doubt to avoid flooding from the river across the road which was a fairly frequent happening in the winter. To get into the cottages one went up three brick steps. Two of the cottages were occupied as dwelling houses but the third was used as a cobbler's shop by Thomas Bonsor and his son." There is a plaque above the door of the third cottage so the gentleman sitting on the step may well be Thomas Bonsor or his son.